I find myself regularly communicating to clients why they need a print-ready file that has “bleed” surrounding their design. Here’s the scoop! Bleed can be defined as “extra area” outside of your final design dimensions. 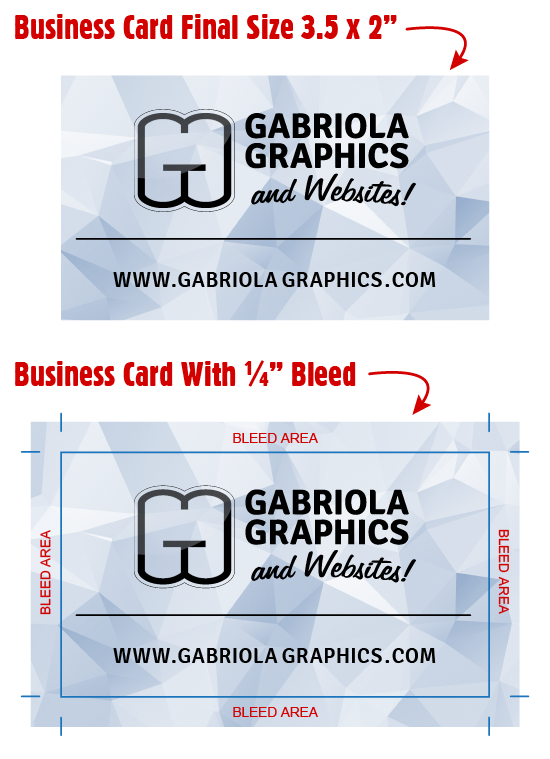 As in the graphic shown, even though the final “cut size” of the business card size is 3.5 x 2″, the file that is submitted to the printer is larger by a quarter-inch around all sides of the design making the design + bleed area = 4 x 2.5″. Why Do You Need To Have This Bleed Area? This whole “bleed topic” exists because when a printer cuts out your designs to their final size (be it a business card, postcard, brochure, etc.) their cutting machine could be out a smidge here or there. If their cutting machine was misaligned by 1mm you would end up seeing a white space where your designed ended and the paper showed through. So the trick needed is to submit a file to the printer that has extra content extended beyond your final cut-size for your file. You need to know nothing unless you are submitting files to the printer yourself. Even though locally I submit files to the printer on behalf of my clients, it’s true that many of my clients from across North America receive files from me and then take them, or submit them electronically, to a printer of their choosing. In which case they just need to communicate to the printer that the file(s) they are submitting include this bleed area.